My daughter’s Big 01 Birthday is coming up here in the next couple of months, and there are certain things which are expected in our community when it comes to first birthdays. So, naturally, The Wife and I have started to make plans. A few years back, The Wife went to the first birthday for the son of a college friend. A private room at a restaurant had been rented out, the event was catered, and the guest list touched just over three digits. This is not the sort of first birthday The Wife and I are intending to throw. But still, things are expected. 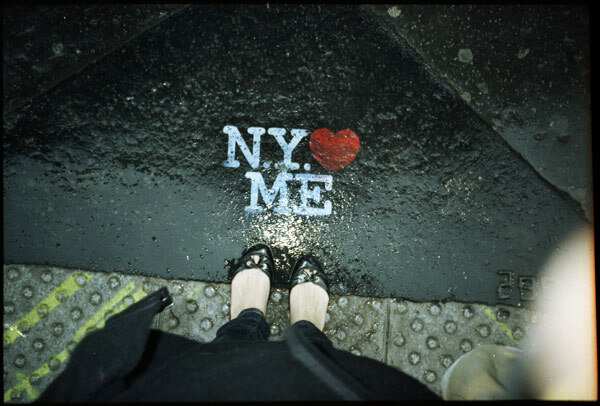 We chose to use our spacious 600-sq.-ft. apartment as a rain location, and opted to hold the festivities in Central Park. In such a beatific locale, our get together would almost undoubtedly please the ghosts of the Park’s brilliant designers, Olmsted and that other guy. Seemingly endless permit forms had to be filled out for any “event” in the park, but The Wife of the R.P. is rather adept at that sort of thing, so the Recent Paterfamilias focused his energies upon other activities. Like napping. So…what to eat? The desert was obvious (cupcakes), but what about the main course? Pizza? Transport (on foot) would be a problem, plus pizza has a tendency to go cold in five or six seconds. Burgers from Shake Shack? Far too iffy, given the very sophisticated palates of those who would be in attendance. Then…The Wife came up with a brilliant solution. Bagels. Easy to transport. Won’t go cold. Will seem appropriate (on Sunday, for brunch, with assorted cream cheeses) for a first birthday party. Excellent! The Wife of the R.P. comes through once again! Now…where to put said bagels? So, the Recent Paterfamilias conducted a serious Internet search for the perfect portable table. (Now, it should be noted here that the Central Park “authorities”—despots that they are—are very particular about the use of tables, chairs, and whatnot on their property, so the R.P. 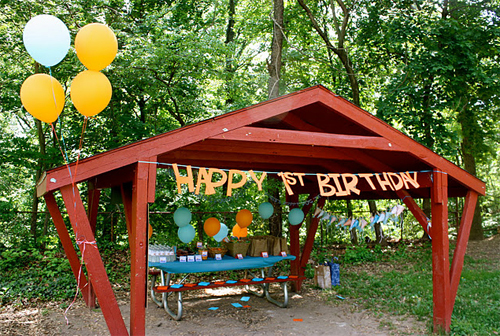 is perfectly prepared to, in, say, eight weeks or so, pen a scathing column on how some park personnel shut down his baby’s first birthday party because he had a single table and two measly stools set out, even though the elaborate park permit application for this event had been filled out completely and almost entirely honestly). As it turns out, there are better options out there for portable tables than a folding card table or a picnic table on wheels. They’re mistakenly called “roll-top tables” (they don’t actually roll, they fold up on themselves, accordion-style), and they can be found at any hunting/fishing/outdoorsy-like retailer. Ok. Great. Table problem solved. We (The Wife and I) wanted two stools. Not chairs (we weren’t tailgating the Harvard/Yale game; we weren’t set up outside Daytona International Speedway on Sunday morning; we weren’t meth-addicts in our rumpus room), we wanted small portable stools. Naturally, a plethora were available, but there was one that really spoke to me. Maybe it was the attractive leather cradle seat. Maybe it was the finely turned hardwood legs. Maybe it was the stainless steel feet which were advertised to hold up against sundry terrains. But, for whatever reason, that little leather stool from the Orvis company really stood out. I wanted it, I needed it, I had to have it (two of them, actually), but then The Wife pointed out that we weren’t booking a private room, we weren’t having a catered event, and we weren’t on an unlimited budget for a Goddamn first birthday party. So I went ahead and ordered these little compact fabric stools from Cabela’s instead. Have you noticed this? People taking and sharing pictures of their feet. 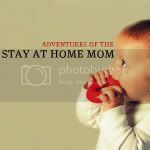 Pictures on Facebook, pictures on Instagram, even pictures over here at Oh My Handmade! all of people's FEET?!!! 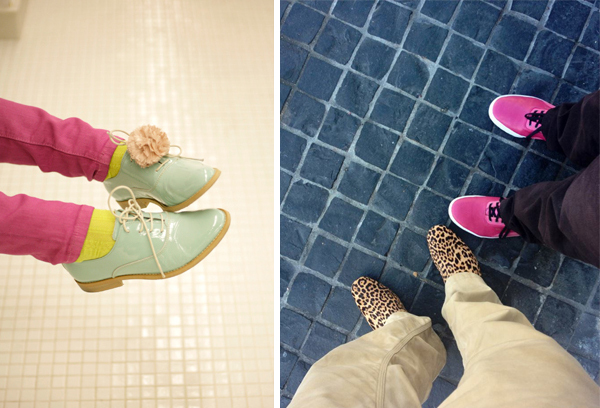 - But not just ordinary pictures of ordinary feet, what makes these pics so fun is that the feet tell a story. 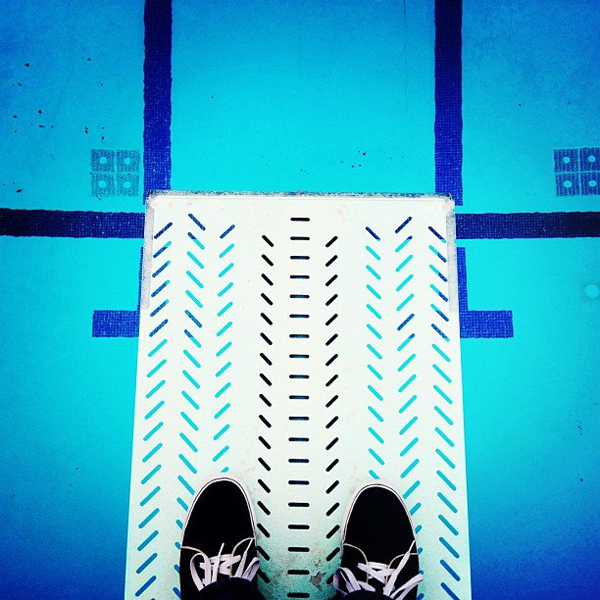 Or these feet - NOT ready to dive in! And of course who can resist Baby Feet! 1. Think about the story you are trying to tell - i.e. : Where are your feet, what are they doing? 5. Don't hold the camera too high. You want feet, not belly! - according the "experts" -- waist height or lower is about right. It's a fun way to capture a moment. Give it a shot. Let me know how it goes! They are finally available on paper in my Etsy Shop - Check 'em out. Happy Friday. The Recent Paterfamilias is proud to state that he is the man of his house. He is the head of his household. The sergeant of his platoon. The king of his castle. The chief of his village. The chief of his tribe. The chief of his chiefdom. The Recent Paterfamilias is master of his domain. He is Neanderthalic Primo. He is The Man. The R.P. calls the shots in his family. And the most recent shot called? The final decision on a little baby-sized baby armchair for his infant baby’s room. As has been mentioned previously, the room of the infant of the R.P. is on the small side. Space is at a premium. So, a multitude of infant chairs were vetted. Chairs for an infant to pull herself into. 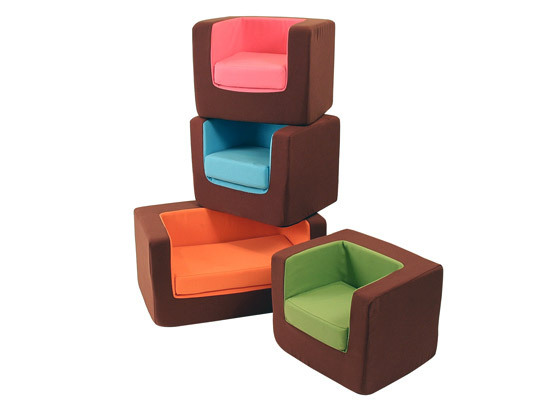 Chairs to feel all grown up in. Chairs in which to look cute so that somebody could go run into the other room, grab the camera, run back, and then find said infant out of the chair and back on the floor, on all fours, playing with that stupid bongo toy that drives the dog (let’s call him “Tedward”) bonkers. Ultimately, after endless searching, the R.P. found a chair of his liking. It was small. It was cube-ish. It was uber-designed and kind of awesome and saddled with the inherently obvious (and pretentious) name of “The Cubino Chair.” Frankly, in all honesty, the chair was awesome. It was perfect. As it turns out, the wife of the Recent Paterfamilias didn’t like the chair. The wife of the R.P. 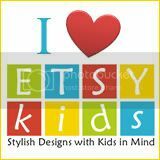 liked other little chairs, bigger little chairs, little chairs from Pottery Barn Kids and The Land of Nod and some other place that the R.P. can’t think of at the moment. But the R.P., himself, didn’t like those other chairs. They weren’t of his taste. They weren’t of his style. He liked the chair he had picked. And all those other chairs were at least six inches larger in every dimensional direction, making them, as he protested, impractical. As has been said, in the nursery of the R.P., space is at a premium. So, the Recent Paterfamilias put his foot down. He told the wife of the R.P. how it was going to be, how his decision was final, and how there wasn’t going to be any more debate on the topic, one way or the other. Period. End of discussion. Case closed. Man of house has spoken. Sometimes, it must be stated, it feels good to be the Chief of the Clan. Ooga. Ugh. It’s got to be said: It ain’t all that great being a Neanderthal. I got inspired to take some new shots of my art. Fresh product photos. I cleared a corner in my bedroom and used my dresser for a little ambiance. I think the pictures came out all right (considering despite what I do for a living, I'm really not a very good photographer) What do you think? You can see them in action in my ETSY shop. Take a look and let me know what you think. Working on a fun shoot for GQ Magazine this week. 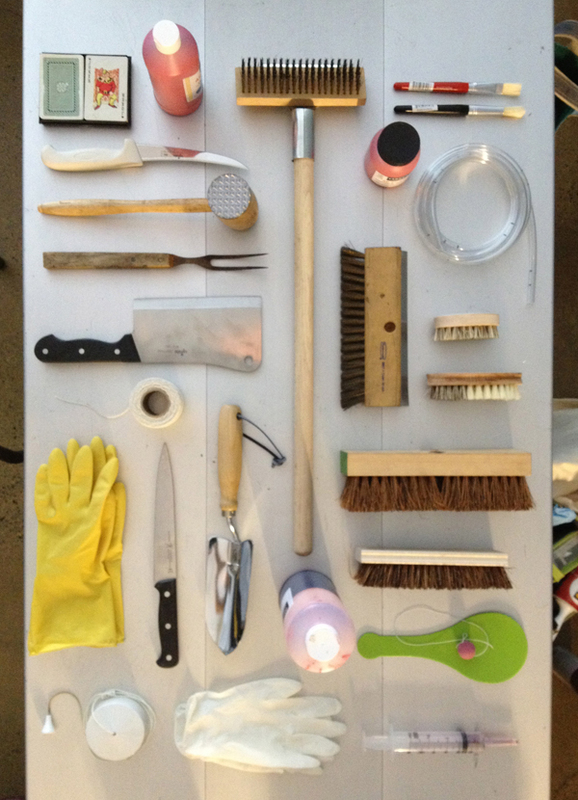 Can't divulge too much info on it (Like who the HOT men we are shooting are) But I can share my fun prop table. An interesting an odd collection of things to play with! 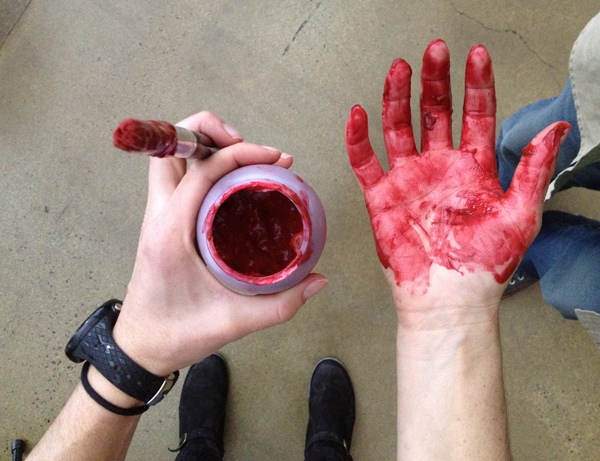 And my poor prop hands -- no wonder manicures never really last on me!!! Can it be so? Orla Kiely for Bed Bath and Beyond? That's the rumor. Due out in May (or so the blog buzz and the preview on Apartment Therapy says). I've only been back a month but those Polish editors are FAST! The 2nd commercial is done, and it's adorable. 3 days to shoot 30 seconds. Everything has to be moved one frame at a time. And everything is also shot horizontally. Could you tell? Everything is flat, and although lying down at work seems like a dream job, the actors have to be real troopers to hold their positions all day long! 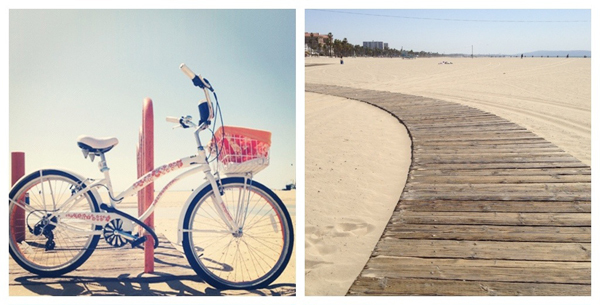 I am working on the idea of doing a California-centric series. 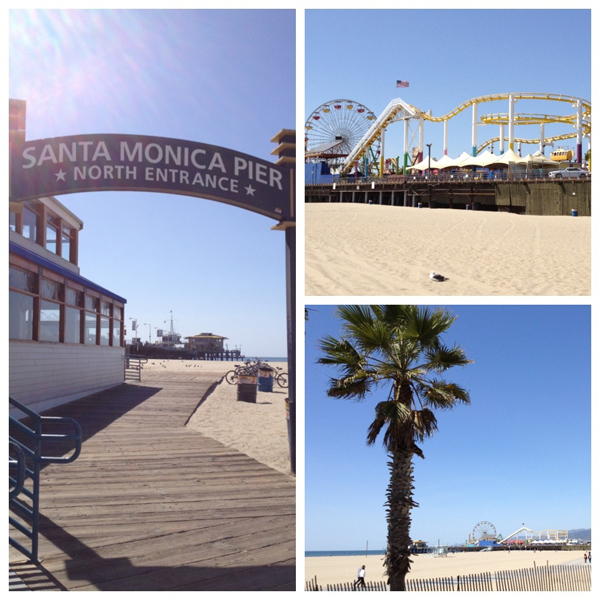 Or even more specifically a few pieces that embody the vibe of Santa Monica. 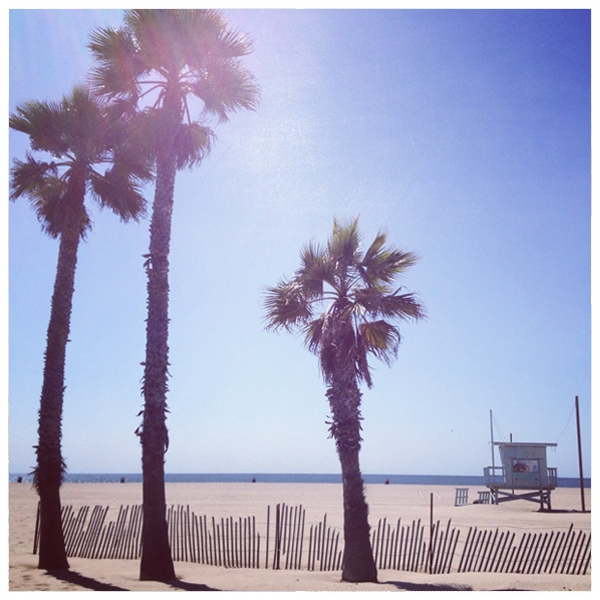 The other day I went for a run along the beach path to get inspired. Can you picture any of these moments as a work of Skårt? Now that we have the rocking horses taken care of, (PS - if you haven't voted yet on which Horse you like best for Gus' Nursery, please click here) we are moving on to crib mobiles. 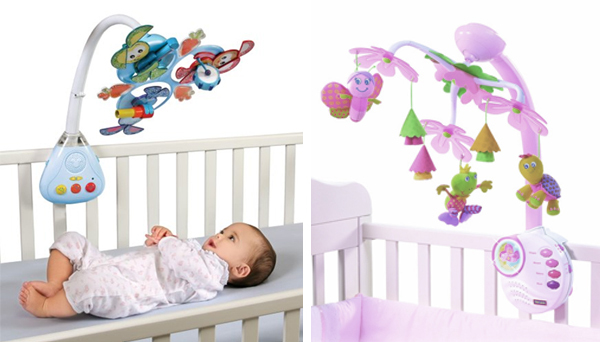 First things you need to get into your head when buying a crib mobile is that it is NOT a decorative piece. 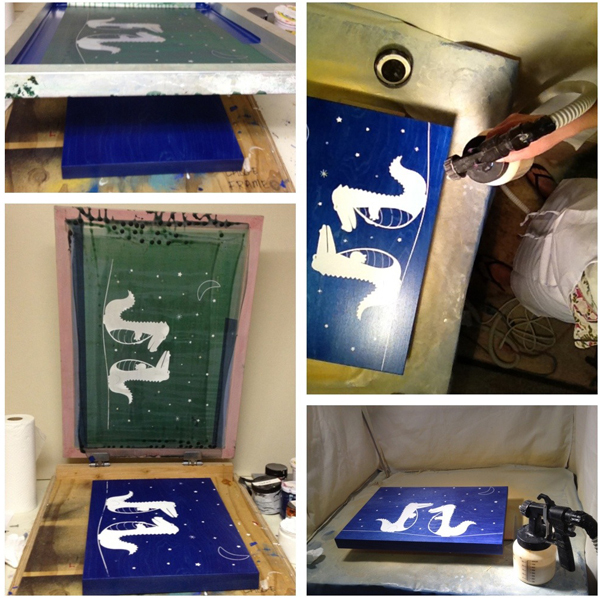 The crib mobile, is not an accessory to be used as the finishing touch accessory on an beautifully designed nursery. The crib mobile is actually a functioning tool in the relaxation and development of your baby. The crib mobile also only really stays up for the first 6 months, after that, Baby can usually start grabbing at it and it can become a hazard. So, if the colors don't quite match, it's not that big a deal. It will only offend your sense of style for a few months. 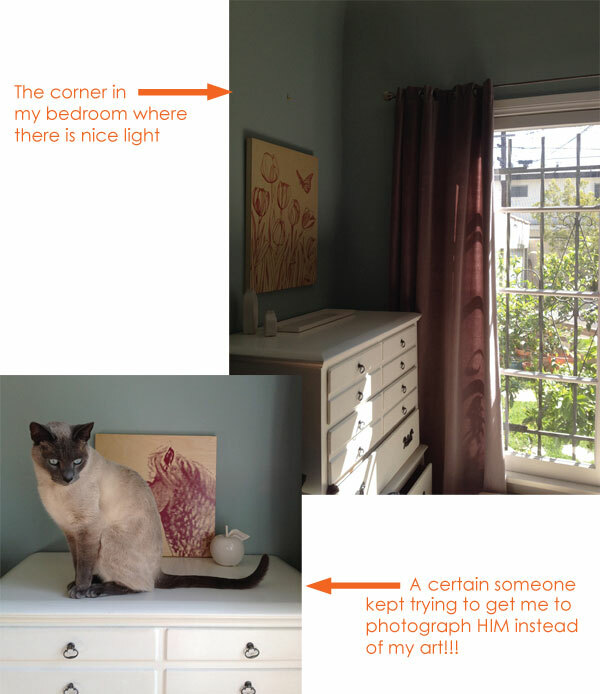 Now that you know that it's okay if your mobile clashes with your decor lets get on with how to find one for you. 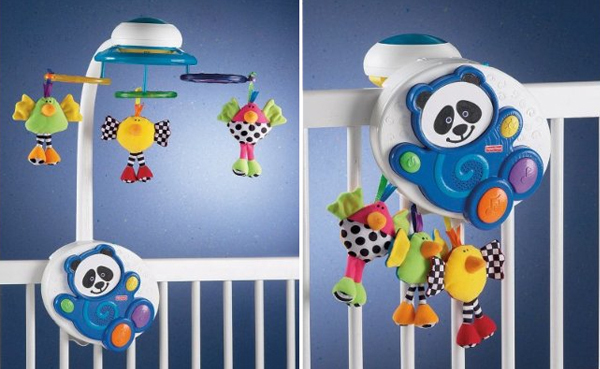 First let's address the questions: Is a crib mobile Necessary? The simple answer is: No. Some babies find it a distraction, some babies don't start sleeping in their crib until they are a few months old and by then as mentioned above it is not suggested to put a mobile up because it's too much of a hazard. 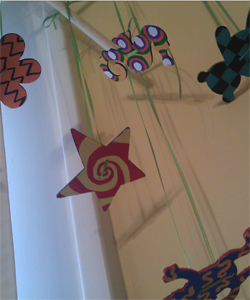 However, mobiles can still be placed other places like over the change table or hung from the ceiling. This guide, is not about those mobiles, this is about How to choose a crib mobile. For very young babies, experts say high contrast black and white is best because that is all they can see for the first few months. However, as they develop, colors and shapes are just as important. Ideally a mobile can have all of the above. For instance, the one pictured on the left is only for $26.99 from Wimmer-Ferguson and comes with variety of cards that you can switch out and adjust. 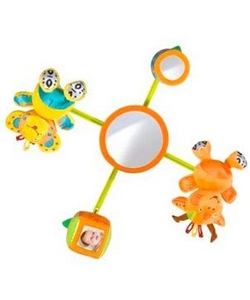 The middle one is the Tiny Love Classic Mobile available for under $40.00 Or the one pictured on the right from Fisher Price called Link A Doos Jungle Mobile can actually be rented for $14.00 from Rent That Toy site for the duration of the time needed. Soft Lullabies and classical music are the best choice for relaxation. Studies have even shown that classical music helps in early development. 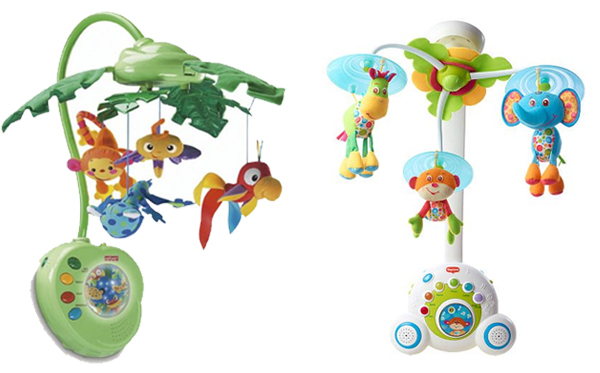 This Fisher-Price Rainforest Peek-A-Boo Leaves Musical Mobile lets you choose from Bach, Beethoven and Mozart, while the Tiny Love Soothe 'n Groove Mobile has 18 different choices for music and sounds. Some mobiles come with different attachments, so that even though you have to take down portions of it, other parts, like the soothing music can stay up in the crib. Or they can attach to the stroller or car seat. 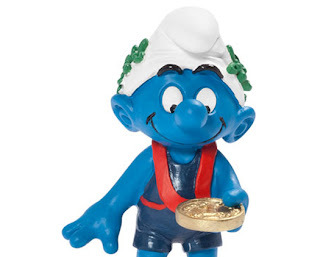 Like this one by Fisher Price. I hope this helps you a little in navigating the jungle of choices out there. I am by no means the complete authority on the subject, the information shared in this post was gained from talking to Mom's I know as well as internet research. If you have notes or suggestions to add on the topic please feel free to leave a comment or email me. Back on the subject of Sunshine's Nursery - which will now be further known as Gus' Nursery. 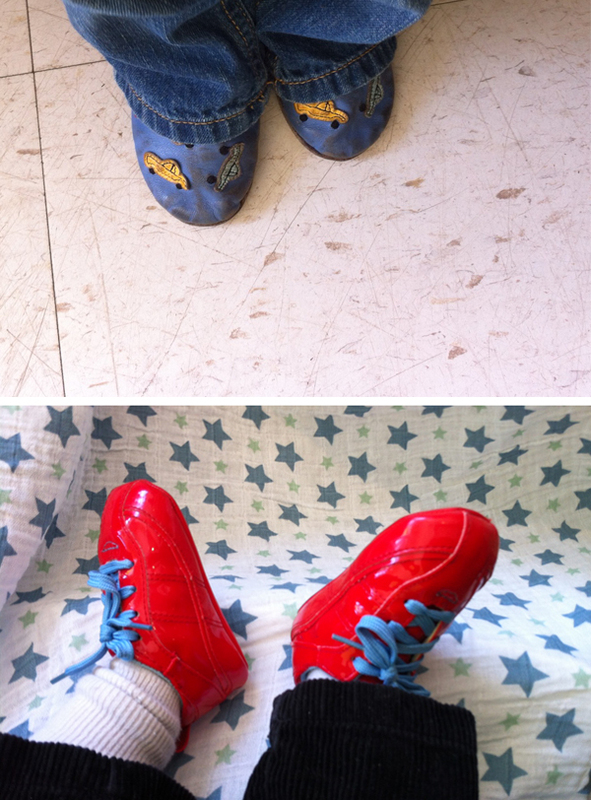 (Since that is the baby boy who is currently inhabiting said room). Gus' nursery is soooo close to completion. A few accessories and we will be sharing the final reveal. Today we are in search of the perfect rocking horse. We can't decide which one. We thought it would be the perfect Blog vote. So please, weigh in with your choice by voting for which you think would look best. 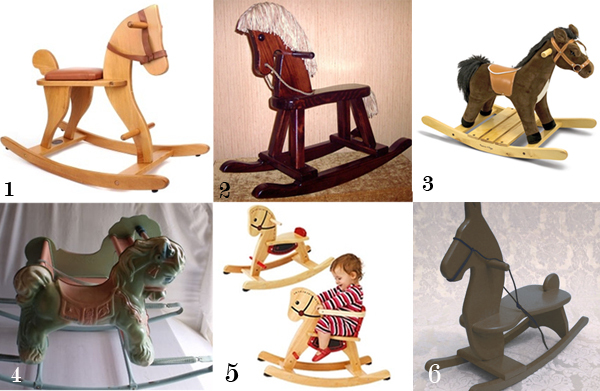 Which Rocking Horse Would You Choose? For reference and reminder - Here is the latest board for the room - showing the majority of elements we have already collected. 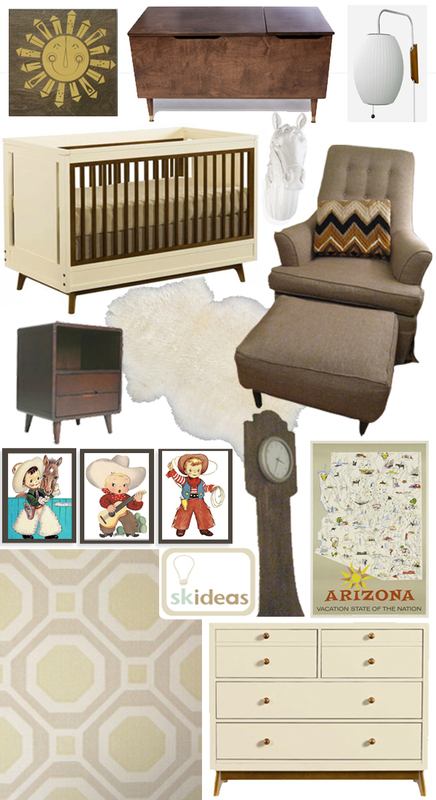 It has turned into a "Mid Century Modern Cowboy Nursery"
In direct opposition of last weeks room, I had to share this room. 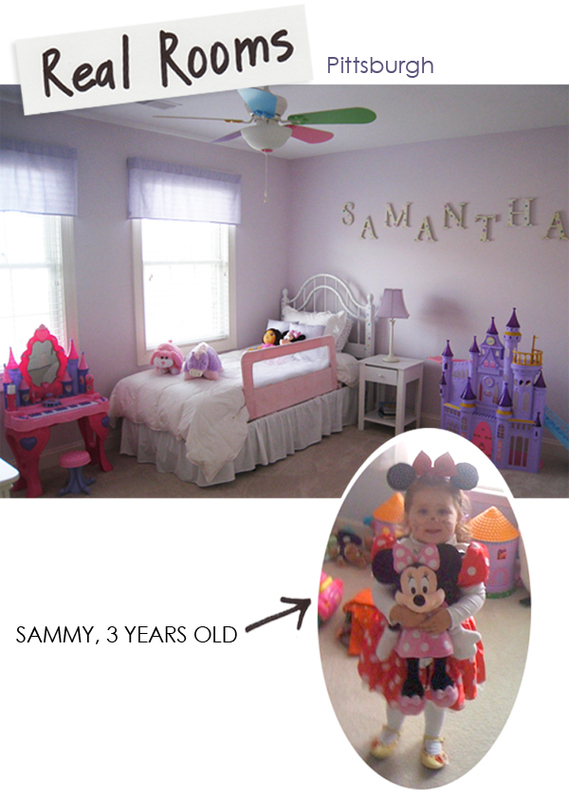 It shows, if you have the luxury, what a difference a basement playroom can make. Ie: Only a few toys are kept in the room. This room is a great example of minimalist decor (not every wall and space needs to be covered) and how just a few key elements can really bring a room together. Everybody seemed to agree that their favorite element in the room was the Hand painted letters. It was the first thing in the room and what the colors and decor was based around. 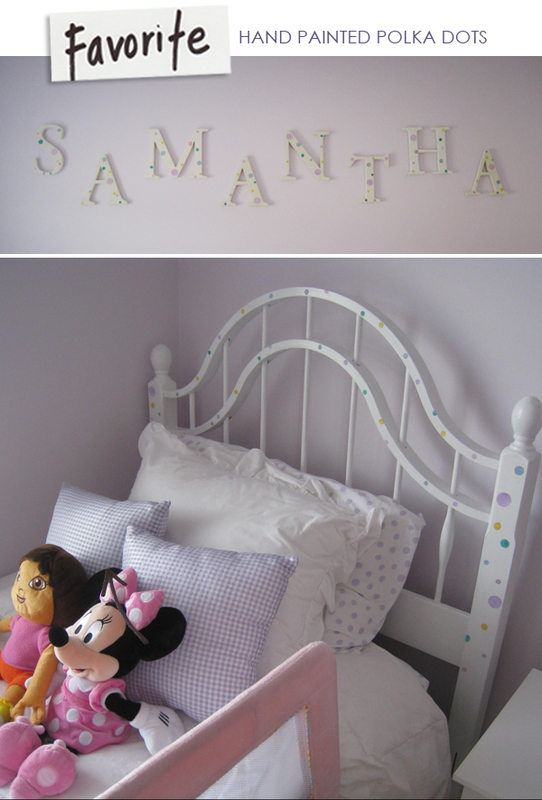 (Grandma got the wood letters at Michael's) She also painted the bed to match! My favorite thing about the room is it's monochromatic nature. 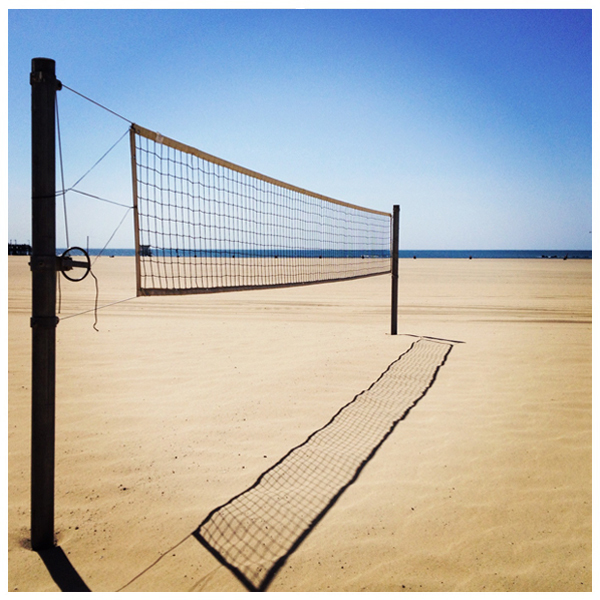 There is something very soothing in it. 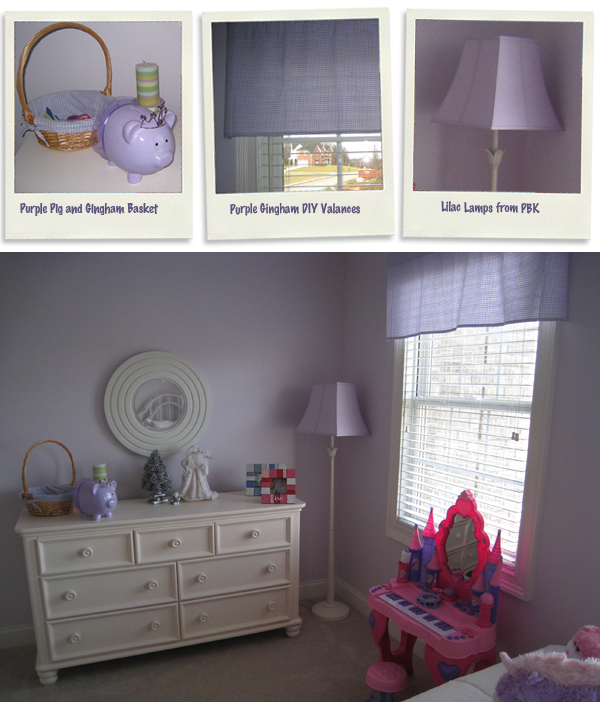 I love the use of all the purple and lilac accessories against the pale lilac colored walls. 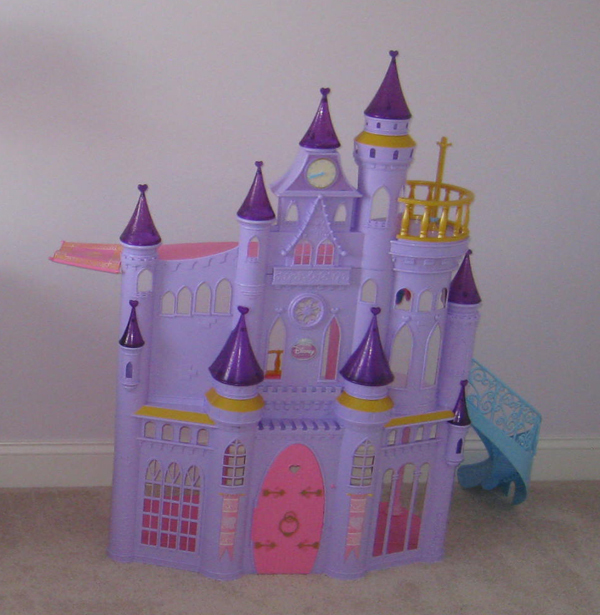 In true 3 year old girl style, Sammy's Favorite thing in the room is her new Disney Princess Castle! May he find further joys and satisfactions in the Land of the Newly Dead. Rest in peace, dear friend. And go with whatever God it is that hard drives place faith in. This is what I was drawing princesses for. Can you spot them? We were back at Disneyland last week shooting more scenes for the Goofy Project. 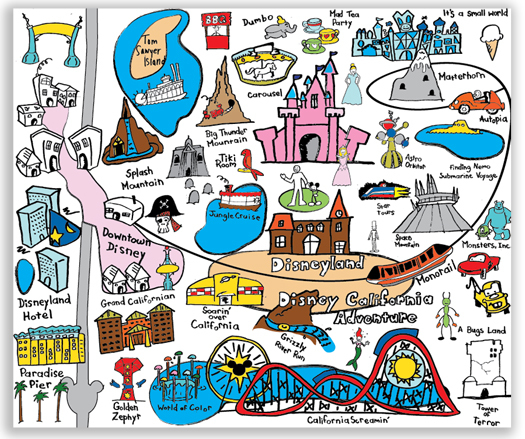 Goofy needed to do some planning of what he wanted to see at Disneyland which is why we created this amazing map (shout out to Jim Roof for helping me illustrate the majority of the Goofy Landmarks on the map). I can't wait for them to finish editing the final film so I can share it with you along with some more very fun behind the sets photos! 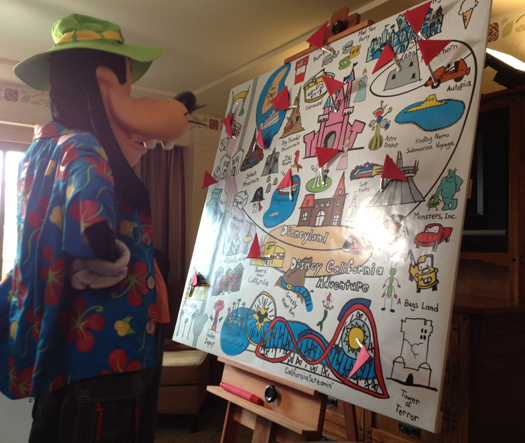 Until then, here is one fun shot of Goofy planning his vacation. 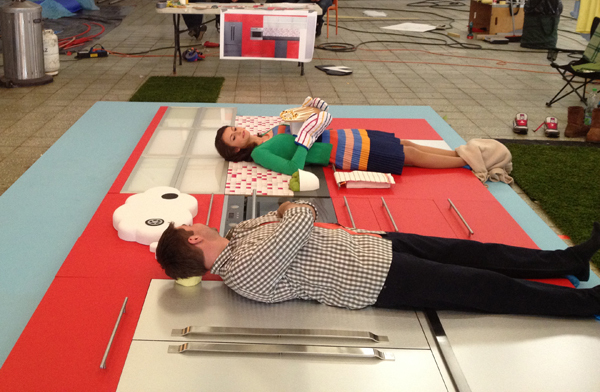 If you didn't know, we were nominated for an Apartment Therapy "Homie" Award Last week. We placed well but *big sigh* we did not make it to the finals. Thanks to all of you that voted. It was a valiant effort. It's okay. For consolation, the husband took me out to a really nice dinner last night to, Son of a Gun, a new restaurant we had been wanting to try for some time. "smoked steelhead roe, maple cream, pumpernickel" - DELICIOUS even though still have no idea what I actually ate! I've also founds some great new blogs to read just by browsing some of the other nominees. As soon as I've had sometime to sort through all I will post MY Favorites here, that way we are all WINNERS! Raise your hands if you are sick of looking at perfectly decorated Nurseries. You know the ones I'm talking about -- the ones where Mom has spent her entire pregnancy crafting the perfect pom-pom mobile, arranging the books on the shelves in rainbow color order and making sure that everything coordinates right down to the blue, organic, eco friendly teddy rabbit. Not in my world. And not in the world of the people I know. That's why I'm taking it upon myself to show you some REAL rooms. But just because the parents didn't match the bumper to the curtains all made from fabric purchased on ETSY, doesn't mean that these rooms don't have charm. Each room has their own amazing, inspirational attributes. So if you are sick of looking at those perfect rooms on design blogs, then follow me as I present my newest series: REAL ROOMS. A 2 bedroom, one story house, in a prime neighborhood, Downtown Toronto, there is not a lot of extra space. 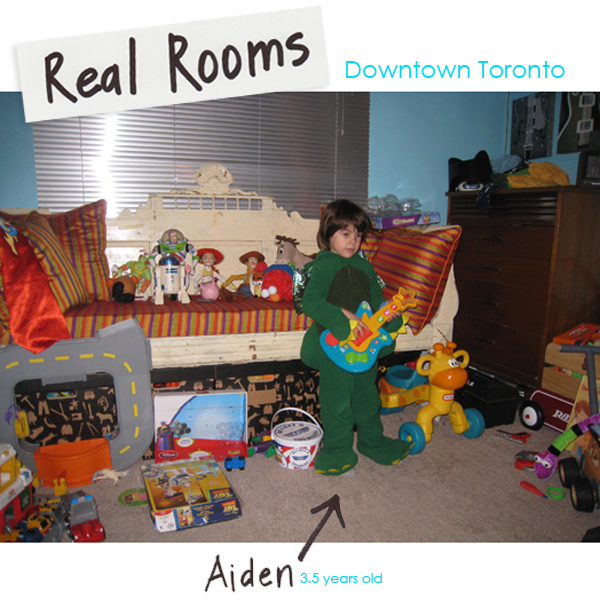 Aiden's room is large for a bedroom, but as you can see it also acts as a playroom, reading room and music room. What I love about this room is the organized and eclectic chaos. There are toys everywhere, but take a closer look, they all have their place. Take and even closer look and you will see that the toys span the decades. 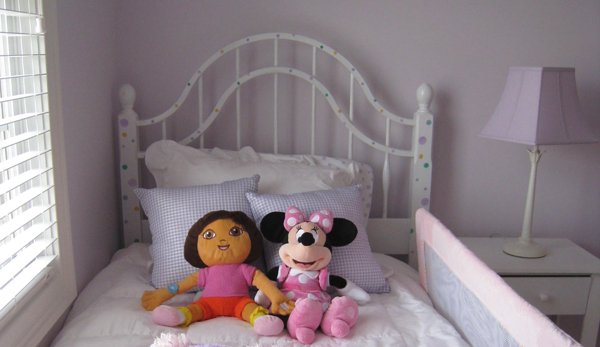 Daddy's R2D2 from when he was a child shares a space on the vintage daybed with Buzz Lightyear and Elmo. "Well, we live in a two bedroom house. So this room was kind of the default room since the other room is our bedroom"
First step was clearing out the room, before Aiden moved in, the room became primarily a place to store everything we didn't have space for. 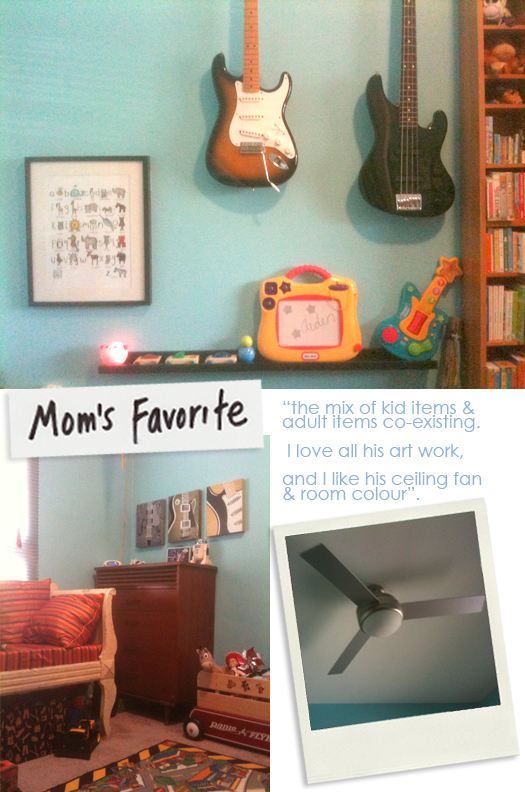 We painted the room a bright Tiffany Blue and added modern elements like the silver blinds and a silver ceiling fan. We had the floor carpeted. All the furniture except for his bed were items that we had. The shelves were in Dad's room growing up. 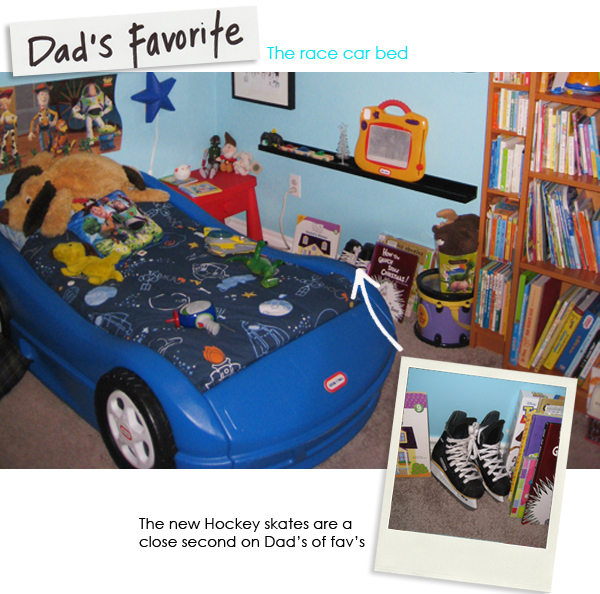 The Day bed was in the room before and the dresser was Mom's from when she was young. 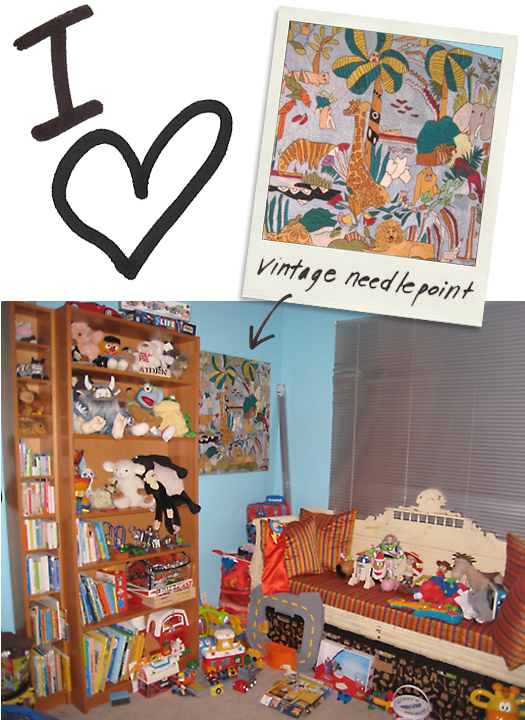 My single favorite item in the whole room is an old needlepoint work of Art that was given to Mom by a neighbor who had it in their sons room when he was growing up (The son is now in his 30's) I love it because it has that total 70's vintage vibe. Plus it's kind of an amazing work of crafty art. "The flooring wasn't the colour I wanted. A dark hardwood floor was my original plan with an area rug. 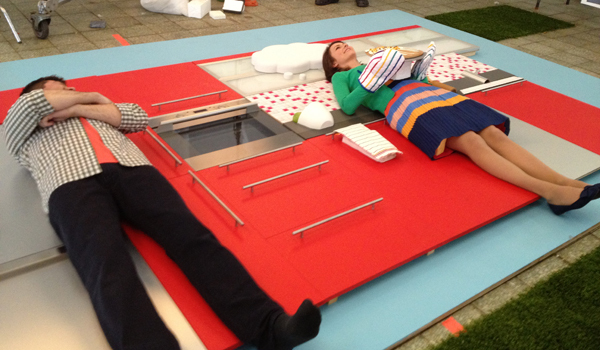 The carpet is a second choice on limited funds,but turns out a better choice to sit & play on-as its soft and warm . "